Clemson Off to Best Start Since 1992 After a two-game, mid-week sweep of Georgia Southern, Clemson is now 12-0 and off to its best start since 1992. That year, the Tigers finished 50-14 and won the ACC regular season championship after beginning the year 17-0. Clemson put together a 10-game winning streak early in the 1998 season, the last instance of 10 straight Tiger victories. The 1996 College World Series team strung together a 15-game winning streak, while the 1995 squad, also a CWS participant, won 25 straight games after dropping the season opener. Clemson is now the consensus number two team in the country after moving up one spot in the Collegiate Baseball and Baseball Weekly/ESPN Coaches polls. The Tigers are the only remaining unbeaten team in the top-25. Clemson vs. South Alabama Friday’s game will be the first night game of the year for Clemson and the ninth meeting between the Tigers and South Alabama, with each team winning four games in the series so far. The last matchup between the two teams was a classic that took place May 22, 1998 in the second round of the East Regional. Clemson, the second seed, and South Alabama, the fourth seed, were tied at one after nine innings. The teams played seven more innings before the Jaguars walked away with a 2-1 victory in 16 innings. 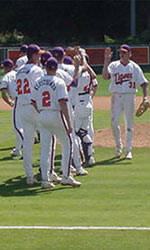 The game was the third longest in Clemson history in terms of innings played, behind a 9-7 loss to Georgia Southern in 18 innings in 1996 and a 5-4 loss to South Carolina in 17 innings in 1994. The four hour and 14 minute game did not end until after 11:00 PM. 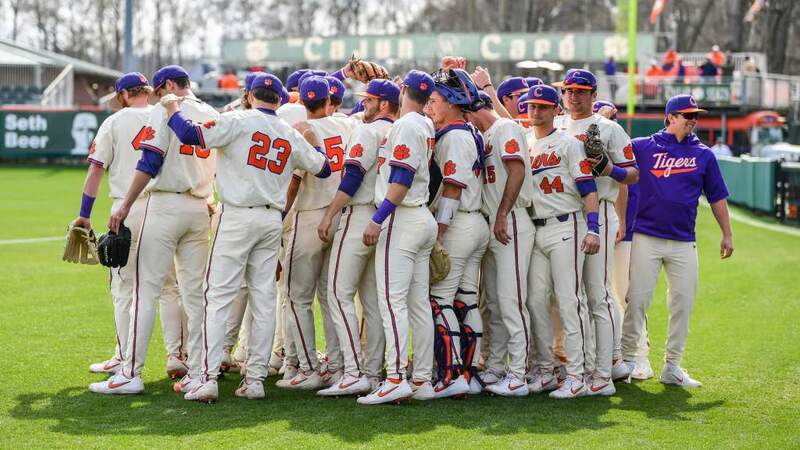 Clemson was then forced to play top seed Southern California at 11:00 AM the next day and the Tigers were ousted from the double-elimintation East Regional 8-5 by the Trojans. Clemson’s last win over South Alabama came when the Tigers took the final two games of a three-game set in 1987. After losing 7-6 in the opener, Clemson claimed a 1-0 victory in game two and an 11-1 victory in game three. South Alabama was the number one seed in the Clemson Regional last year, but the two teams never faced each other. The Jaguars dropped two games to Seton Hall while Clemson went undefeated and advanced to its third straight Super Regional. Tigers Down Georgia Southern Clemson remained undefeated with two wins over Georgia Southern this week. The Tigers defeated the Eagles 9-2 on Wednesday behind a grand slam from Khalil Greene and a three-run home run from Jeff Baker. Steve Reba pitched five innings and picked up his fourth win of the year. Clemson used 23 hits from 12 different batters in Tuesday’s 20-8 victory. Khalil Greene, Jarrod Schmidt added to their home run totals while Jeff Hourigan hit his first career home run in a game that was delayed 20 minutes by rainy conditions all day in Clemson. The weather did not cool off the Clemson bats as Clemson used a seven-run second inning to take the lead and four-run innings in the fourth and seven innings to broaden its advantage. Ryan Childs got his second wins in as many starts for the Tigers. Team Breaks Single Game Batting Average Record When Clemson defeated Georgia Southern 20-8 on Tuesday, the offense pounded out 23 hits in only 44 at-bats for a batting average of .522, a new school record. The previous standard was set 20 years ago when the Tigers won 22-10 at Auburn on May 8, 1982. On that day, Clemson batted 29-56 (.518). Tigers Sweep Purdue Steven Jackson, Jeff Hahn and Paul Harrelson combined to limit Purdue to just two runs, and a fifth inning Purdue error proved to be costly in Clemson’s 4-2 victory over the Boilermakers Sunday afternoon at Kingsmore Stadium. The victory improved Clemson’s record to 10-0, while Purdue, ranked 27th in the nation in the preseason Collegiate Baseball poll, fell to 2-8. The victory completed a three-game sweep of the series for the Tigers. Clemson was led at the plate by Khalil Greene, who had three of Clemson’s six hits. Michael Johnson had a walk and a single to drive in a run. Russell Triplett had the only other RBI for Clemson. Purdue took a 1-0 lead in the top of the third. Kriner led off with a single to center and went to second on a single by shortstop Mitch Koester. Two outs later, Nick McIntrye singled to right to score Kriner with the game’s first run. Purdue, who finished second in the Big Ten last year, made the count 2-0 with a run in the fifth. Koester opened the inning with a walk. He moved to second on a stolen base and scored on a single by left fielder Adam Fazio. Clemson 5-0 vs. Ranked Teams With his team’s sweep of 25th-ranked Auburn and two wins over South Carolina this season, Clemson Head Coach Jack Leggett now has 97 wins over top-25 teams since taking the helm in 1994. Clemson’s wins over South Carolina were Leggett’s 25th and 26th over a team ranked in the top-five in one of the three major polls. His last top-five victory prior to Saturday was a 7-4 win at #4 South Carolina on March 4, 2001. Clemson defeated second-ranked Florida State three straight games from May 6-8, 2000, the last instance of consecutive victories over a top-five team before this weekend. Return of the Long Ball Clemson has continued to launch the long ball in 2002 after a big 2001 season. Entering the series with South Alabama, the Tigers have 21 home runs in 12 games. If the pace contnues, the team will finish with approximately 98 home runs at the end of the 56-game regular season. That would be the second best team home run figure in Clemson history. The 1991 team set a school record with 111 home runs. The 1997 team launched 95 home runs. After hitting only 37 long balls in 2000, the proliferation of home runs returned to Clemson in 2001. The Tigers smashed 85 home runs this season. That is more than double the 2000 season output of 37 dingers. Fifteen of the 37 homers in 2000 came at Doug Kingsmore Stadium, while Clemson has more than tripled the total and hit 54 out of Kingsmore Stadium in 2001. The fences to the stadium were moved in 10 feet prior to the start of 2001. Baker Moves Up Career Home Run List Junior third baseman Jeff Baker moved into 6th place on Clemson’s all-time career homerun list with two home runs in the season opener against Purdue and is moving up the charts. After his three-run home run against Georgia Southern on Wednesday, the junior now has 37 career home runs and is within reach of Matthew LeCroy’s school record of 53 home runs. Records in Range for Greene Khalil Greene assured himself a spot in the Clemson batting record books last season when he set new standards for being hit by a pitch in an inning (2), game (3), season (21) and career (47). But the senior is making a name for himself in many other categories of the Clemson record book. He doubled three times in an 11-10 victory over South Carolina, tying a Clemson record. It was the third time he accomplished the feat. Greene is near the top of many career categories, including third in doubles (72), fifth in hits (296), sixth in RBIs (204) and fifth in at-bats (834) and sixth in total bases (467). The outstanding defensive player also set a new Clemson mark last season for fielding percentage by a shortstop. His .965 fielding percentage broke Bill Spiers record. Johnson on a Home Run Tear First baseman Michael Johnson homered twice against College of Charleston on March 6, giving him six home runs in the Tigers’ first six games. He hit a grand slam in last Saturday’s 9-6 win over Purdue and went deep again on Tuesday against Georgia Southern. He homered five times in the last six games of 2001, which means the first baseman has 13 home runs in his last 17 games dating back to last season. The feat of one player homering twice in a game was a somewhat frequent occurrence for the Tigers in 2001, and the trend is continuing in 2002. Johnson’s two-homer performance was the fifth of his career and the third for Clemson this season. Jeff Baker hit two against Auburn on Feb. 22 , the eighth time of his career that he hit two homers in the same game. He leads Clemson in that category. Jarrod Schmidt is the only other current Tiger with multiple home runs in more than one game. He hit two home runs April 6 at Florida State and again April 14 vs. Duke in 2001. Clemson had 10 multi-home run games last season, the most in school history. Johnson Named ACC Player of the Week Clemson first baseman Michael Johnson was named ACC Player of the Week for March 4.. The honor was the first for Johnson, who was named MVP of the Clemson Regional in 2001. The Georgetown, SC native batted 6-11 (.545) with seven RBIs in three Tiger victories last weekend. Johnson began the weekend by going 2-4 with an RBI against the College of Charleston. He hit the game-winning home run in Clemson’s 9-7 victory over South Carolina on Saturday and then blasted two more home runs and a double on Sunday as the Tigers defeated the Gamecocks 11-10 in 10 innings. He is the second Tiger to be named Player of the Week by the ACC in 2002. Jeff Baker shared the honors Feb. 25. Clemson led for most of the game but entered the bottom of the eighth trailing 4-2. David Slevin led off with a single, Steve Pyzik walked and L.J. DeMaino was hit by a pitch to load the bases with none out. After a Khalil Greene drew a walk to plate one run. All-American Jeff Baker then stepped to the plate and drilled a line drive to right field that cleared the bases and gave Clemson a 6-4 lead heading into the ninth. Radio and Televison Schedule Announced Fifty of Clemson’s 56 regular season baseball games and all postseason games will be broadcast live on the radio in joint partnership between Clemson Tiger Sports Properties and WCCP-FM (104.9) in Clemson. In addition, the Tigers will have six games televised by either Fox Sports Net South or Comcast/Charter Cable. Clemson Tiger Sport Properties will broadcast 36 regular-season Clemson baseball games this season, including all 24 conference games. The broadcast schedule also features 12 non-conference games, including all four games with South Carolina, two games with Georgia, one game each with Coastal Carolina, Winthrop, Wofford and a three-game series with Maine, the alma mater of Clemson head coach Jack Leggett.